Marina's Kitchen Table: Meeting in the Meadow: There's No Place Like Home! Meeting in the Meadow: There's No Place Like Home! The Man Without a Country is a sad story that tells the plight of Philip Nolan, who renounces the United States of America and is sentenced to spend the rest of his life on warships of the United States Navy, without the right to ever again set foot on U.S. soil or hear its name mentioned. The saddest story of all is to learn of someone who is spiritually homeless. There is no greater emptiness, loneliness, or isolation than this. 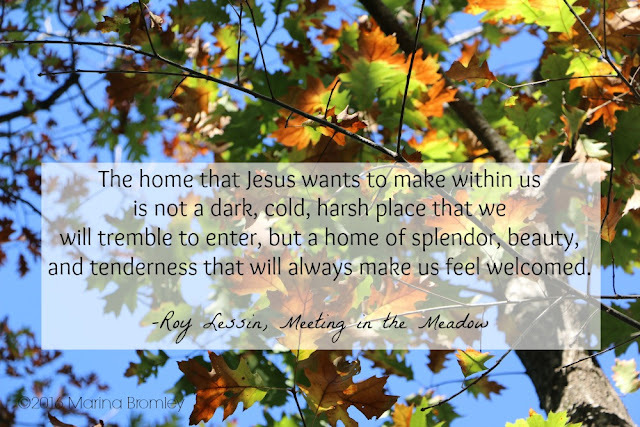 Jesus Christ came to make His home within our hearts. His presence makes it possible for every person to find their true home and their eternal home with Him. The home that Jesus wants to make within us is not a dark, cold, harsh place that we will tremble to enter, but a home of splendor, beauty, and tenderness that will always make us feel welcomed. 1. A home of love...where His arms are extended to help, to support, to encourage, and to embrace. 2. A home of acceptance…where you are valued, celebrated, enjoyed, and appreciated; where He is genuinely happy to be in your company. 3. A home of protection…where you can be sheltered from the coming storm and find safety from the heat of day, the cold of night, and the battering winds that beat against your life. 4. A home of fellowship…where your hearts can open up to one another, where feelings can be expressed, where thoughts can be exchanged; where deep touches deep, and soul touches soul in harmony, in unity, and in sweet communion. 5. A home of light…where a glow fills the hallways and floods the rooms with welcomed illumination; where it is possible to clearly find your way and fully discover the treasures within. 6. A home of warmth…where the fire of His presence burns brightly; its beauty drawing you close—bringing laughter, shared joys, common interests and celebrated victories, while the golden flames of mercy and grace warm the deepest chills within.